What is the Lowrance Hook Elite 7 Ti Best For? If you want to learn about fish finders, anyone who is anyone will know about Lowrance fish finders. Having invented the technology some 60 years back, Lowrance are still key innovators in the electronic fishing equipment market today. 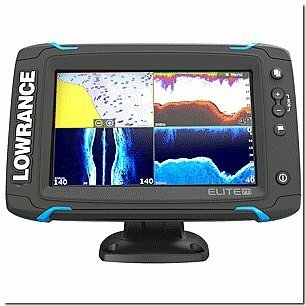 In fact, Lowrance’s range of Elite Ti fish finders offers some of the most dynamic products on the market, offering high spec sonar technology, built-in GPS, super-fast processing, and other incredible features. The Lowrance Hook Elite 7 Ti is not an exception to the quality of this range. Featuring CHIRP Sonar for both down and sideways imaging, exceptionally accurate GPS and built-in mapping system, and incredibly quick processing speeds, this device delivers high-quality imaging on a touch-screen device with both WiFi and Bluetooth capabilities. A superior device when compared to other brands, Lowrance brings fish finding technology into the next generation with this model. Combining the traditional aspects of down and sideways sonar imaging, with high-tech digital imaging, the Hook Elite 7 Ti is really great value for money. Check out the guide below to see why our expert team believes this. We’ve outlined the features that really stand out, along with some pros and cons for you to decide if this fish finder best suits your angling needs. This device can be purchased in four different screen sizes: 5, 7, 9, and 12 inches. The touchscreen is easy to use, while the technology embedded within is of the highest caliber, featuring elite mapping systems and excellent StructureScan software. The HDI transducer provides a crystal-clear picture-like image that combines both sideways and downwards imaging, and uses FishReveal technology to relay this unambiguously. The FishReveal technology makes it super simple to see what’s going on below the surface. The technology works so well thanks to the CHIRP sonar device embedded within it, that features Advanced Signalling Processing. The CHIRP sonar helps separate fish from structural or vegetational features in the water – giving you a clearer picture. The FishReveal technology combines the CHIRP sonar with the DownScan Imaging, negating the need for you to view this on two screens. Instead it collates this data to give you one clear image. For many anglers, to truly get a full picture of what’s below the surface, you end up hooking up a rig that includes multiple transducers. Not only does this mean drilling a bunch of holes, it’s also quite a convoluted system to manage. The HDI transducer included in this model can perform the task of multiple transducers, while only installing the one device. The transducer features Lowrance Med/High CHIRP sonar and StructureScan software, which enables you get a comprehensive image of the fish you are targeting and the structure that may hold their schools. This med-high skimmer transducer combines downward and sideways imaging technology to create a full picture to the angler of fish, structure, vegetation, and other objects below the surface. The imaging is so good in fact, that it has been complimented many times for its ‘picture-like’ imaging, thanks to the LSS-HD schools. The trackback feature on this fish finder is excellent as it really relieves the pressure of logging your finds in that moment. When you find something good, you can be so desperate to log it that you miss the opportunity. Thanks to the trackback technology in the Hook Elite Ti 7, you can scroll back through your activity to mark points that provided you with fruitful rewards or seemed liked future points of interest. The navigation tech within the device will help you easily find these spots again on your next trip out. The touchscreen controls of this device make it much easier to use than older models with physical buttons. This is because the buttons would often get jammed with dirt, sea salt, or other substances from the water or air. The touchscreen controls are designed for simplicity, allowing you to complete commands with very little effort. This leaves you more time to fish! The controls also allow you to integrate features with your boat. The Quick Access Control bar means you can get to shallow water anchor systems, audio controls, and trolling motor control. In fact, the software can even give you data reports on how well your engine is doing! The built-in wireless connectivity enables you to have remote control of your fish finder from your smartphone while downloading software updates, C-Map Genesis maps, and service reports while on the open water. The mapping software is second to none in this device. The High-Detail C-MAP US Enhanced map software allows you to see over 3000 US rivers, lakes, and waterways. You can narrow the search down to specific features on water ways such as ledges or bays. You can zoom right into to contour lines of one foot on 3000 lakes, but up to ten feet on 11000 lakes! The software also includes coastal maps and is renowned as one of the leading mapping softwares for mariners. The company itself is dedicated to providing customer service and therefore offers a one-year warranty for all Elite 7 Ti fish finders. However, more than that, if it fails in the first five years, they will replace it with whatever the newest model is at the time! This model is one of the higher end devices and therefore behaves as such. In this respect, it has many advantages including excellent imaging and touchscreen functions, top of the range software, integrated boat controls, and great GPS and trackback features. The Images: The thing about this device that really stands out is the final image. While many devices offer a split screen view, this fish finder collates all the data from the different input devices and combines them to create a clear picture of the fish targets and the structure where they sit. The software provides almost picture-like images that make it near to impossible to miss your targets. The screen has various options that enable you to view your target from many different angles, to understand the behavior of the fish and the environment in which they’re in. The touchscreen makes it far easier to use than conventional buttons and frees up space for a larger, clearer screen. The Software: This model combines some of the best software on the market today for anglers. The advanced FishReveal technology helps to create an image using the CHIRP sonar and down imaging technology so you can immediately see where schools are hiding. This means more time fishing and less time trying to interpret the image. Moreover, the StructureScan software enables you to create an image of what is below the surface and where the fish could be hiding or moving. This enables you to set up nearest to areas most likely to be popular, while avoiding unpredicted obstacles. C-MAPS Genesis mapping software is also one of the best mariner softwares available. It enables users to zoom into thousands of lakes, up to one foot contour lines in some cases. This gives you great insight and enables you to really take advantage of the GPS precision. The wireless connection means you can always keep the fish finder up to date with all the latest software. The GPS and Trackback: The GPS in this device is extremely sensitive and accurate. This enables you to accurately work out where you are using the mapping software, and record accurate information regarding the structure and activity in those areas. The trackback software means that you don’t have to rush the recording and can input this data later. With such accurate mapping, you’ll find it easy to mark spots on the map, while the precise in-built GPS will find your way back on your next trip, without trouble. This model is well-known for being one of the best fish finders available today. However, there are a few improvements we would make. The five-inch screen is far too small to work with, while installation is confusing thanks to the complicated installation manual. The Screen: One of the best features of this machine is its capacity to work in side by side mode or to split the screen into four sections in some instances. The problem with the five-inch screen is, while it’s clear enough when not split, you cannot enjoy the split-screen features well as the screen is so tiny. When split, the image seems to blur and tiny digits become unreadable. The Manual: The instructions seem to presume that you would understand how to work a device like this and can easily integrate it into your system. The instruction book is very hard to understand and you may find yourself using online guides to come to grips with this. This takes up a lot more time than would be necessary if the instructions were clearer. If you’re not a professional angler, this is the fish finder for you. While top spec, this fish finder isn’t really suited to those who need specific precision in their imaging. This is a great all-rounder that anyone can get their head around and it serves its purpose in a hardy, durable manner. It’s not complicated once you get going and no newbie needs to be afraid of it. This fish finder is not a portable device. If you’re looking for a kayak device or something you can move from boat to boat, this isn’t for you. The Hook Elite 7 Ti is suitable for people who own their own boats, as it is integrated to the system and screwed in place. Once secured, it isn’t designed to be taken out again. If you’re new to the game of a keen hobby angler, this fish finder is an exceptional all-rounder. Combining hardy, durable components and materials with top-range software, this device has amazing mapping software and GPS technology, helping you locate the fish you want to score. The brand is well-trusted and the warranty and five-year return policy show the confidence in their product and level of customer service you can expect. Remember that this product is not a portable fish finder. This is best suited for anglers who own their boats, as it needs to be fixed to the boat and can’t be easily moved.